(Nanowerk Spotlight) The fascination with two-dimensional (2D) materials that has started with graphene has spurred researchers to look for other 2D structures like for instance metal carbides and nitrides (see our previous Nanowerk Spotlight "Graphene was only the beginning; now MAX phases get two-dimensional as well"). One particularly interesting analogue to graphene would be 2D silicon – silicene – because it could be synthesized and processed using mature semiconductor techniques, and more easily integrated into existing electronics than graphene is currently (read more: "Compelling evidence for silicene - the silicon analogue to graphene"). Another material of interest is 2D boron, an element with worlds of unexplored potential (read more: "2D boron has potential advantages over graphene"). Another new two-dimensional material – made up of layers of crystal known as molybdenum oxides – has unique properties that encourage the free flow of electrons at ultra-high speeds (read more: "New 2D material for next generation high-speed electronics"). A new, very comprehensive review article in ACS Nano ("Progress, Challenges, and Opportunities in Two-Dimensional Materials Beyond Graphene") takes a look at our current knowledge of 2D materials beyond graphene. The paper outlines the different chemical classes of 2D materials and discuss the various strategies to prepare single-layer, few-layer, and multilayer assembly materials in solution, on substrates, and on the wafer scale. In addition, the authors present an experimental guide for identifying and characterizing single-layer-thick materials, as well as outlining emerging techniques that yield both local and global information. They describe the differences that occur in the electronic structure between the bulk and the single layer and discuss various methods of tuning their electronic properties by manipulating the surface. Finally, they highlight the properties and advantages of single-, few-, and many-layer 2D materials in field-effect transistors, spin- and valley-tronics, thermoelectrics, and topological insulators, among many other applications. In contrast to graphene, other layered systems are composed of two or more elements, making the synthesis more complex. While the growth of single-layer graphene was significantly improved in only a few years by understanding some of the key parameters for growth, it remains to be seen if similar methodologies can be applied to the growth of single or multiple layers of other layered materials. The authors note that this calls for further nucleation and growth studies as well as an adequate set of characterization tools comparable to those used to characterize graphene. Probing the molecular and vibrational structure of 2D materials is inherently challenging due to the small sample size. However, numerous methods have been developed to enable their identification and characterization. 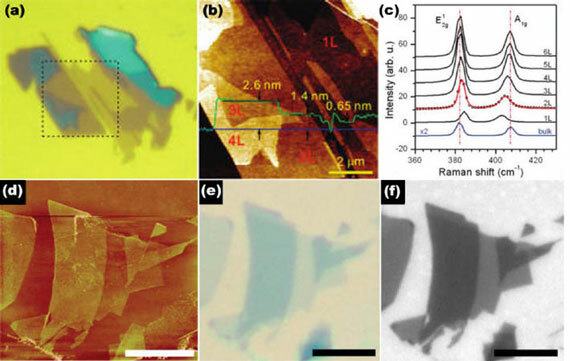 The review dedicates a section to the characterization of 2D materials in which they provide a standard how-to guide for studying single-layer-thick materials with the help of Fluorescence Quenching Microscopy (FQM), Atomic Force Microscopy (AFM), Raman Spectroscopy, Transmission Electron Microscopy (TEM), Scanning Tunneling Microscopy (STM), and X-ray Diffraction (XRD). A large part of the review is dedicated to the discussion of the properties of novel 2D materials beyond graphene and their potential for device applications and integration. The unique qualities of 2D materials, such as their reduced dimensionality and symmetry, lead to the appearance of phenomena that are very different from those of their bulk material counterparts. "This difference is perhaps most glaring in the transformation of the band structure as the single layer is approached. Additionally, since a 2D material is entirely made up of its surface, the interface between the surface and the substrate and the presence of adatoms and defects can dramatically alter the material's inherent properties. The two-dimensional nature of these materials also plays an entirely mechanical role as they are inherently flexible, strong, and extremely thin. These materials exhibit other unique and potentially useful properties including high electron mobilities, topologically protected states, tunable band structures, and high thermal conductivities. The development of 2D materials is expected to improve current device technology, and their novel transport and topological properties might provide additional opportunities for spintronic devices and quantum computing. Even multilayer assemblies of 2D materials have a broad base of potential applications including batteries, supercapacitors, and p-n junctions." In concluding their review, the authors point out that the salient differences between bulk and few or single layers are just starting to be understood. "New fundamental studies can address single-layer scale differences in many-body interactions; phonon transport, such as flexural phonon modes; interfacial electron-electron, electron-phonon, electron-magnon, etc. coupling; excitonic and other quasiparticle properties; the nature and impact of defects and the substrate; the influence of high doping, strain effects, and electric fields; mechanical properties; quantum size effects; and edge effects in transport. "At the single-layer scale, interactions with the surroundings often dominate experimental observations, and consequently, there are a multitude of unexpected experimental challenges in isolating the intrinsic material properties. There are numerous exciting opportunities in developing the growth of high-quality large-area materials with controllable layer thicknesses. Such systems would not only expand our understanding of the underlying physics but potentially lead to the discovery of unanticipated phenomena and applications. Already, new understanding of the 2D materials has contributed to entirely new scientific frontiers such as spin- and valley-tronics. The ability to harness such unique properties and phenomena will surely lead to exciting technological advances."